And finally, these two, which were written by a special education student of mine for whom writing is a huge challenge (and reading even moreso). He wrote these on two separate days and asked me to come out in the hallway to see them after he hung them up. This boy is quiet as a mouse; he rarely says an unsolicited word, which is why these especially touched my heart. The banner is just outside my classroom door, in the hallway people pass when they enter the school. If I ever need to smile, I just walk out and read some of the messages. It's stuff like this that makes me say to myself, "I'm putting on my armor; more than ever, struggling learners are going to need my help even more in the coming years." I'm keeping my head down. Today is a good day. How about you? Did you have a teacher who made a difference in your life? Feel free to share your story or put a link in your comment if you've ever blogged on this topic. I heard he lives down here in FL now. I wonder if I should try to look him up? I got choked up reading the hearts to you, too! Mrs. 4444, is the best, most dedicated and intelligent teacher at this school and is the most favorite teacher ever…deserves a raise and a company car. That makes me all teary, too. I had some wonderful teachers, and my kids have too. My youngest daughter's teacher last year for 3rd grade was absolutely amazing, the kind that makes kids love coming to school & learning. Now my daughter wants to be a teacher when she grows up, and her Gifted teacher really thinks she'll end up pursuing that goal. I'm glad you have something positive getting you through this difficult time! My first grade teacher is the one who discovered I needed glasses too. What a difference! I couldn't see, no wonder I had trouble learning to read! What a nice way to show appreciation from the people who really count. Teachers shouldn't have to work "for fun or for free" as Susan Isaacs says, but it's good to get feedback from the kids. I give a bow to Bertha Bjorkman of Ely, Minnesota who helped me like math in the sixth grade. What a great idea!I write because of a teacher who believed in me. At the time he was the only one in my life who belived in me. I'm so thankful for his encouragment. These make ME want to tear up! I love the one that says the teacher helped show she needed glasses -- aahhh!!! And the one that said "sorry I made you cry" ... wow.. these are all so special. I remember so many of my teachers & the impact they made on me. I remember my 1st grade teacher so well & so adored my 5th grade teacher. When we had to leave her at the end of the year, I literally SOBBED the whole evening... teachers are so special! Wow that is such a great idea....teachers make all the difference in the world. I have been lucky enough to have many teachers that impacted my life over the years. Thank you for all you do! This is such a wonderful idea and one that I'm sure brightens the day of the teachers in your school! 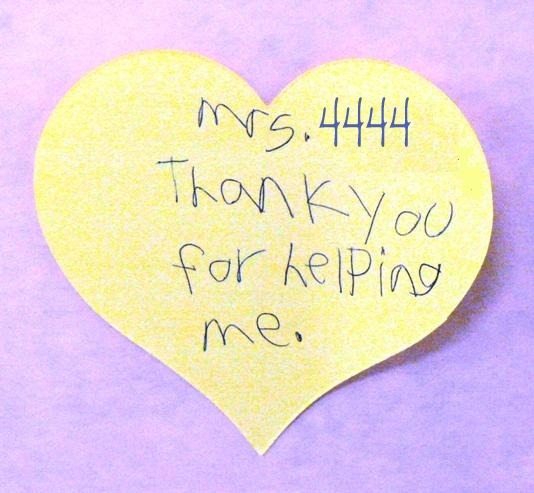 Great idea to show appreciation for teachers who get so little of it. This is so sweet. I know you all give more than the parents or school board could know. I can honestly say in all my time in school -elementary as well as high school -I never had a teacher who didn't impact on me in some positive way or other! The one who stands out in my mind though was the lady who I had for 5th and 6th grade, who was my absolute favorite teacher ever! But I think the person who left the greatest impact of all on me was the man who was the principal of our high school as he was the person who told me, quite emphatically, that yes, I was college material (something I was very unsure about because my Mom was convinced I wasn't) and although it took me a long time -32 years -to get to attend college (and I loved that experience) -I realized then how right that man had been way back in my life! I actually made the Dean's list four times in college compared to making the honor roll in H.S. only twice! Amazing, isn't it, the impact those teachers can and do have on our lives and for a long, long time after we leave them behind too! To teach is to touch a life. Many have touched mine. love the post - this has to be the best benefit of teaching. You are an amazing teacher/wife/mother and woman. This post made me smile. You are a special woman. And I think your student said it best. I'm glad I know you!! I have a handful of teachers special to me- 2 of whom I think practically saved my life on very different occassions and very different circumstances. 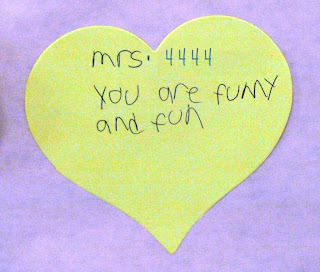 I bet these little love notes made these teachers' day. Awww! These are so sweet! That is just so sweet and beautiful! I love these SO much. I am really glad you posted them! !